Victor Piturca has assembled a squad for a training camp that will take place in Antalya, starting the 21st of January, a period that should make the national team coach realize which players from Liga I should enter/stay in his plans for the next qualifying campaign. A decision that was obviously criticized by some clubs, especially afterthe news that the 6 players from Steaua will be allowed to return to their club after the first few days and the friendly game vs. Turkmenistan. A double standard that won’t help Piturca, but should offer more time to impress to those from smaller clubs. With Tatarusanu and Pantilimon the first two choices, Balgradean will have to confirm the excellent first half of season this spring, with Lung still promising, but not as convincing as the Red Dogs’ 24 years old who conceeded only 10 goals in the first 18 matches. Roman is a disappointment at club level and just like Chipciu, who just took a step forward in his career, will need to prove themselves in the league, while the likes of Neagu, Pintilii and even Bourceanu have already proved their limits, at least in my eyes. Good to see Bumba getting a call-up, he’s the youngest player (just turned 18) in Liga I who gets to play on a regular basis, but I’m sure it’s a too discrete signal for the club owners/managers/coaches to start promoting talents at a very young age. When this will become a habit in Liga I, there will be once again some hope for the national team. Forwards: D. Niculae (AS Monaco), Stancu (Galatasaray), Bucur (Kuban), Sburlea (Rapid), Marica (Stuttgart), L. Ganea (Dinamo). With Chivu allowed to stay with Inter, as he had the busiest schedule of all, during this start of year, there’s an obvious tendency to test some very promising youngsters, like Papp, Gardos and Rapa, but the problem is that they could be sollutions where Romania boasts the most quality players: in defense. 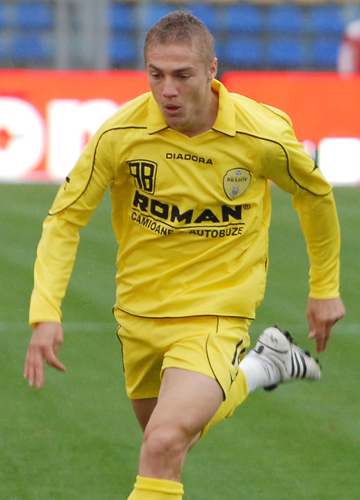 Left Jiul Petrosani on a free transfer in January and made an instant impact at International Curtea de Arges, where he collected 11 appearances in the top flight, finishing his first half of season at this level as the team’s captain. Now, he moved alongside his coach and colleagues from International to Pandurii, where he offered an excellent display in the first round of the season, against Unirea Urziceni. 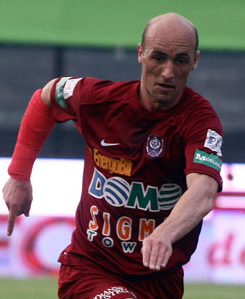 In spite of his small size for a centre-back, Pintilii managed to contain Unirea’s top centre-forward, Bilasco, an outstanding player in the air and a key man in Levy’s tactical plans. Pintilii was focused, quick, aggressive when required and outplayed Bilasco with his excellent anticipation, controlling his opponent on the chest and coming out for the ball at the right moment, with impressive efficiency. On top of that, he had to sweep several loose balls and generally had a lot of work, considering the poor displays from his partner Ousmane Viera and especially the highly-rated-for-no-reason left back, Cardoso. Looked a lot like Steaua’s former captain, Mirel Radoi, and I recall Pintilii being offered to Steaua a few years ago, but, at that time, the Bucharest side had players like Radoi, Ghionea or Goian in the team and the centre back had to return in the second division. Very discrete on the transfer market until now – after years of investments that haven’t brought the expected trophies, FC Timisoara re-signed Hristu Chiacu from Dinamo, who will come on loan for another season. The attacking midfielder could be followed by a player of a similar profile from the same club. Ianis Zicu, who was once under contract with Internazionale Milano and is out of favor at the Bucharest club, due to his mediocre performances and terrible attitude, has been spotted in Timisoara, where he will negotiate a deal with the Viola outfit. On another note, the former Energie Cottbus defender Ovidiu Burca, currently a free player, has rejected “a tempting offer” from Timisoara, stating that he feels there’s an unstable environment in Romanian football. I’ll translate that for those interested: “FC Timisoara just had its accounts blocked, the club owner says at least once a week that he’s not motivated anymore to invest in the team and is at war with the local authorities”. My view: Hmm, tough one to call and the surprise of the final analysis, definitely, as Arman Karamyan was known until the second half of last season mainly as the twin brother of Artiom. The move to Steaua and the goals that followed were decisive, but also proved that there wasn’t a consistent player on the left wing., able to deliver and convince during the past championship. Good to see Petre in the top five, I’ve considered him a natural winger with potential since his Unirea Urziceni days, while Dinamo’s Alexe showed a lot of promise and will probably continue to develop into a quality winger indeed. My choices: Well, seeing Cesinha in his last couple of appearances back to his best, I’d say it’s a shame he’s prone to injuries. Craiova’s Gangioveanu is still a player to watch – maybe he’ll switch clubs or settle down and focus on football -, just like Gaz Metan’s promising winger Paul Parvulescu, who offered some quality performances, but wasn’t always convincing during this season. Note: the top five is taken from Gazeta Sporturilor, a newspaper that uses the service of Digital Soccer Project. These results are based on a series of specific criteria for each position, include only players that have collected at least 1.200 minutes on the pitch in the past season and the only subjective part of the analysis consists in the average marks received by the newspaper’s writers. My view: Yes, Muresan deserves to be up there, but Alexa doesn’t! The holding role is/should be much more than just sitting in front of the back four and winning balls, such a limited player isn’t useful to a winning team anymore. And when you have one pure anchorman on the pitch, adding another one (Bourceanu) when playing at home should be classified as attempted murder on football, a crime that brought punishment on a decent person, but a coach that still needs to develop, like Ioan Ovidiu Sabau. Sorry, got a bit carried away with this :-)). Back to our top: consistent season from Giurgiu, who also got a couple of important goals and was labelled by some as the best defensive midfielders in the league, but I cannot understand how a massive midfielder like Ousmane N’Doye could have missed the top five. Anyway, he’ll compensate this by getting the first place when we get to the nightclub performances section! My choices: Already said enough about N’Doye (btw, the guy is the leader when it comes to taking out opponents! ), let’s include here Ionut Neagu, who was playing until the winter for the bottom placed in the second division, CSM Ramnicu Sarat, and is another nice coup from Marius Stan and Dorinel Munteanu. Also, it was an excellent first season in Liga I for the Japanese Seto Takayuki, while Timisoara’s Bourceanu would have been higher in the standings if he would have played in his natural role, as he often had to drift wide on the left flank, in a very unconfortable position for this workaholic central midfielder. My view: Fair results, given the fact that, of all Romanian players on this position, Roman established himself as the first choice for the national team from Liga I, but it would have made sense to see this analysis including some stats regarding the players’ crossing ability. He’s the best when it comes to taking out his direct opponent and has the best shooting accuracy and these two criteria pretty much describe him as a player. Nice to see Antal grabbing the fifth spot, another second division player selected by the expert Marius Stan, a president with an excellent eye for promising footballers. My choices: CFR’s first serious buy of the summer, Hora, was only in eighth place, in spite of a good season, but I would mention Gaz Metan’s Alexandru Muntean, as a nice prospect, and International’s experienced utility player Cosmin Bacila, who produced an impressive scoring rate in the second half of the season, which was definitely useful to the club’s survival in the league.